The Internet of Things (IoT) is an emerging global infrastructure that employs wireless sensors to collect, store, and exchange data. Increasingly, applications for marketing and advertising have been articulated as a means to enhance the consumer shopping experience, in addition to improving efficiency. However, privacy advocates have challenged the mass aggregation of personally-identifiable information in databases and geotracking, the use of location-based services to identify one’s precise location over time. This paper employs the framework of contextual integrity related to privacy developed by Nissenbaum (Privacy in context: technology, policy, and the integrity of social life. 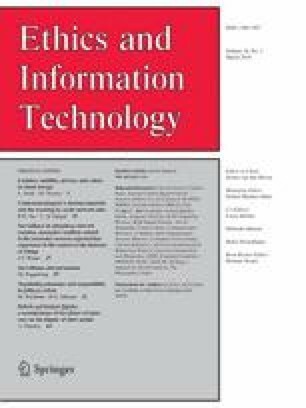 Stanford University Press, Stanford, 2010) as a tool to understand citizen response to implementation IoT-related technology in the supermarket. The purpose of the study was to identify and understand specific changes in information practices brought about by the IoT that may be perceived as privacy violations. Citizens were interviewed, read a scenario of near-term IoT implementation, and were asked to reflect on changes in the key actors involved, information attributes, and principles of transmission. Areas where new practices may occur with the IoT were then highlighted as potential problems (privacy violations). Issues identified included the mining of medical data, invasive targeted advertising, and loss of autonomy through marketing profiles or personal affect monitoring. While there were numerous aspects deemed desirable by the participants, some developments appeared to tip the balance between consumer benefit and corporate gain. This surveillance power creates an imbalance between the consumer and the corporation that may also impact individual autonomy. The ethical dimensions of this problem are discussed. Acquisti, A., Gross, R., & Stutzman, F. (2011). Faces of Facebook: Privacy in the age of augmented reality. Black Hat 2011. Retrieved on December 11, 2011 from http://www.heinz.cmu.edu/~acquisti/face-recognition-study-FAQ/acquisti-faces-BLACKHAT-draft.pdf. Albanesius, C. (2011 May 10). Senator has ‘serious doubts’ about privacy of Google, Apple location apps. PC Magazine. Retrieved on June 8, 2011 from http://www.pcmag.com/article2/0,2817,2385150,00.asp. Angwin, J., & Stecklow, S. (2010 October 12). ‘Scrapers’ did deep for data on Web. The Wall Street Journal. Retrieved on October 20, 2010 from http://online.wsj.com/article/SB10001424052748703358504575544381288117888.html. Ashton, K. (22 June 2009). That ‘Internet of Things’ thing. RFID Journal. Accessed from http://www.rfidjournal.com/article/view/4986 on May 11, 2010. Barnett, E. (11 Jan 2010). Facebook’s Mark Zuckerberg says privacy is no longer a ‘social norm’. The Telegraph. Retrieved on March 10, 2010 from http://www.telegraph.co.uk/technology/facebook/6966628/Facebooks-Mark-Zuckerberg-says-privacy-is-no-longer-a-social-norm.html. “China working on unified national Internet of Things strategic plan.” (2010 July 5). TMCnews. Retrieved on August 10, 2010 from http://www.tmcnet.com/usubmit/2010/07/05/4884535.htm. Duhigg, C. (2012 February 16). How companies learn your secrets. The New York Times Magazine. Retrieved February 17, 2012 from: http://www.nytimes.com/2012/02/19/magazine/shoppinghabits.html?_r=2&pagewanted=1&hp. Federal Trade Commission. (2010 December 1). FTC staff issues privacy report, offers framework for consumers, businesses, and policymakers. Retrieved on November 24, 2011 from http://www.ftc.gov/opa/2010/12/privacyreport.shtm. Federal Trade Commission. (2011 November 21). FTC announces agenda, panelists for facial recognition workshop. Retrieved on November 24, 2011 from http://www.ftc.gov/opa/2011/11/facefacts.shtm. Federal Trade Commission. (2012 March 26). Protecting consumer privacy in an era of rapid change: Recommendations for businesses and policymakers. Washington, DC: Federal Trade Commission. Retrieved on March 27, 2012, from http://ftc.gov/os/2012/03/120326privacyreport.pdf. Hill, K. (2012 February 16). How Target figured out a teen girl was pregnant before her father did. Forbes. http://www.forbes.com/sites/kashmirhill/2012/02/16/how-target-figured-out-a-teen-girl-was-pregnant-before-her-father-did/. Internet of Things Conference Organizing Committee. (2010). Internet of Things. Retrieved on March 17, 2010, from http://www.iot2010.org/outline/. Keller, J. (2011 September 29). Cloud-powered facial recognition is terrifying. The Atlantic Monthly. Retrieved on October 1, 2011, from http://www.theatlantic.com/technology/archive/2011/09/cloud-powered-facial-recognition-is-terrifying/245867/. Microsoft. (2013, June 6). Privacy by design: How Xbox One and the new Kinect sensor put you in control. Retrieved on June 6, 2013 from: http://news.xbox.com/2013/06/privacy. nViso. (2011). Technology. Retrieved on October 11, 2011 from http://www.nviso.ch/. O’Connor, M. C. (2011 April 6). European Commission issues framework for measuring and mitigating RFID’s privacy impact. RFID Journal. Retrieved on April 6, 2011 from http://www.rfidjournal.com/article/view/8345.